Welcome to Loudoun County! 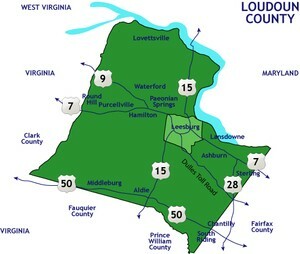 Just a 35 mile drive from Washington D.C. and bordered by the Potomac River, Loudoun County is one of Virginia's fastest growing counties. Its rural landscape is a combination of spectacular views and scenic byways. Loudoun County is peppered with small towns, charming villages and gracious horse country with rolling hills. Residents and visitors to Loudoun County especially enjoy the award-winning wineries, championship golf-courses and countless shops and fine dining options. Within Loudoun County is the historic town of Leesburg, which is a popular destination year long, with its brick sidewalks and rustic storefronts, artisan boutiques, antique shops and a full calendar of special events each summer. If you're planning to move to Loudoun County let us know as we would be thrilled to send you additional information about Loudoun County Property Search and Real Estate homes for sale!